For most homeowners, the garage can be a neglected, messy space. Drawers of varying size hold hand tools and small items. Sports gear, tools, and yard equipment are just a few examples of items that can create clutter. Add in patio furniture, bikes, and holiday decorations – what once was a garage is now mostly a disorganized pile of stuff. However, there are many ways to get more out of your garage space. In one of our latest projects, we helped one family take their front-facing garage and turn it into a tidy, efficient space, with a place for everything and everything in its place. 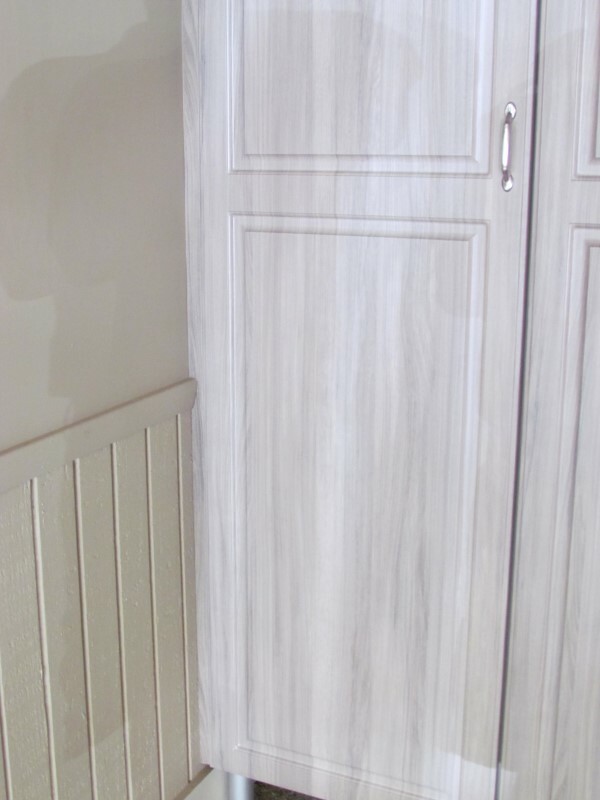 Minimal fillers provide maximum storage while eliminating unsightly nooks and crannies. 1. Aesthetically Speaking – Before the upgrade, the storage consisted of the typical assortment of exposed metal and plastic shelving cobbled together over the years. 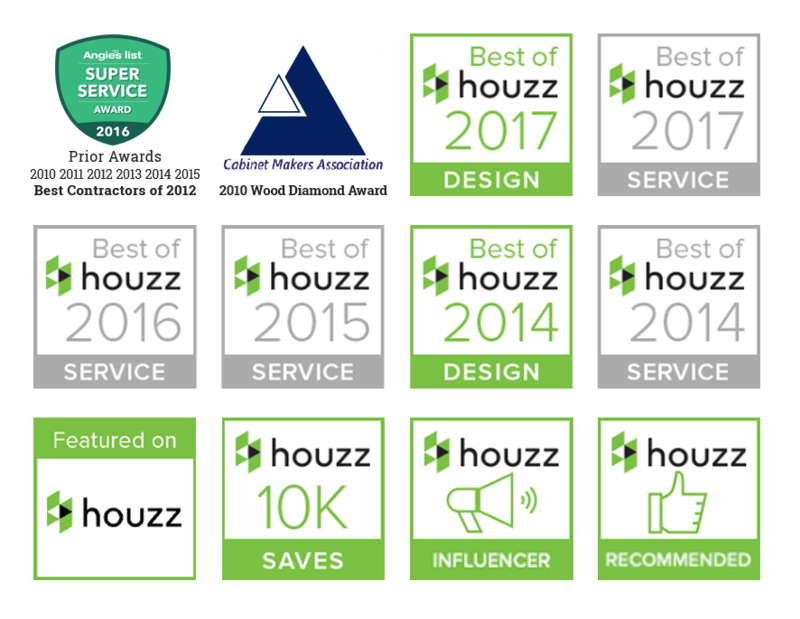 To upgrade the look, we used a textured woodgrain material which provides a rich feel without the cost or durability issues of stained wood. 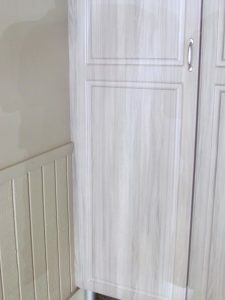 By covering the entire wall, we created a fitted look while eliminating any nooks and crannies along with the temptation to leave items out in the open. 2. 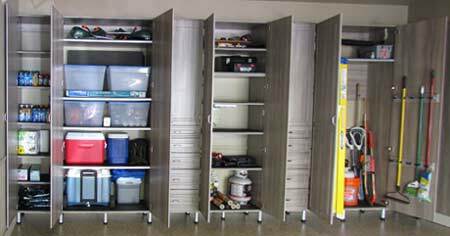 Elevated Cabinets – The cabinets are raised off the floor using adjustable aluminum legs to protect against water damage and for ease of inspection and cleaning when necessary. 3. 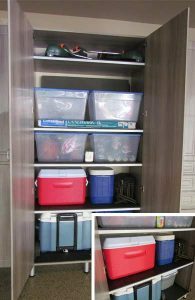 Smart, Wide Shelving – Wide shelves closest to the interior door hold bulky household items close at hand. 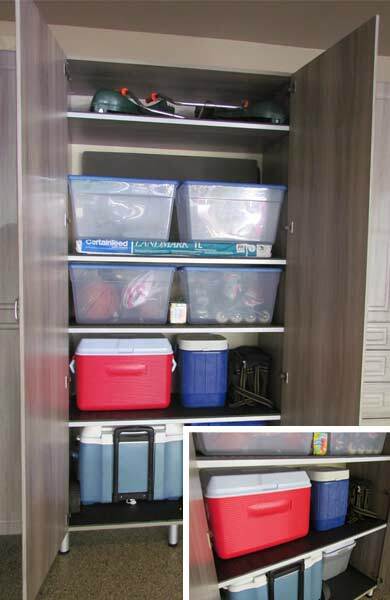 Oversized shelves for large coolers and bins are reinforced with aluminum stiffeners to prevent sagging. 4. 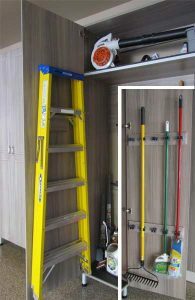 Everything Organized – A full-size ladder hangs from the back of a door, as do brooms and rakes, to fully utilize the depth of the interior space. 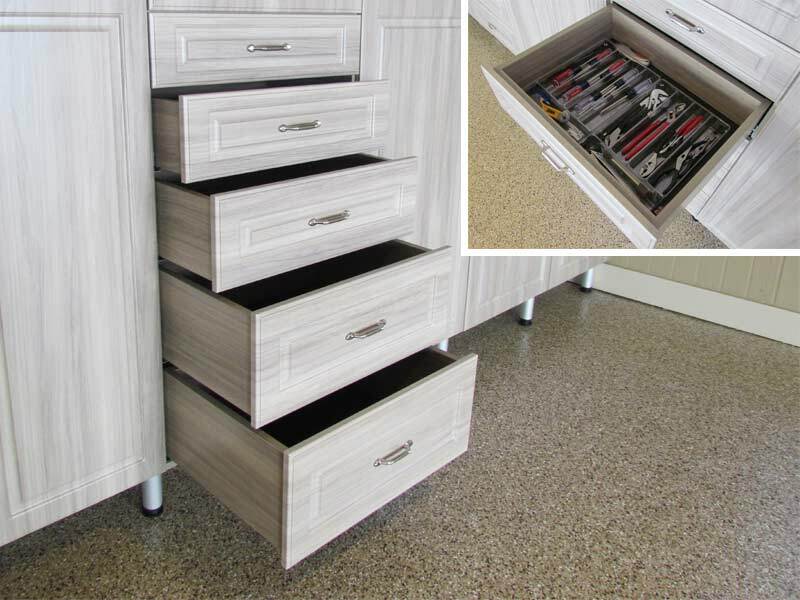 Drawers of various heights keep hand tools and other small items organized. Wide garage shelves have reinforced edges to prevent sagging. A 6′ ladder and brooms hang neatly on the backs of large doors, making full use of otherwise wasted space. 5. Sweeping Success – Additional broom hooks tucked into the front corners allow quick access to frequently used items while keeping them hidden from public view. And a special cabinet covers two large electrical panels, completing the clutter-free look of the renovated garage. 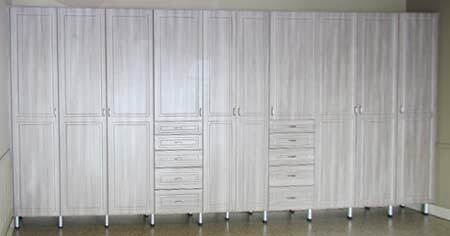 At Atlanta Closet & Storage Solutions, we custom fabricate each project to fit your space, your taste and your budget. If you’d like to learn more about getting your garage in shape, feel free to drop us a line or check out some of our other garage project photos. The completed garage is a sight to behold, devoid of clutter or mess.